My big next step after Project Runway. Establish my design studio here in New York and work towards my AW 2012/13 collection! 115 backers pledged $8,531 to help bring this project to life. Olivier Green is a clothing line based in New York. It is my goal to empower people through clothing and allow them to be unique, strong and confident. Olivier Green's clothing is urban, modern, sophisticated and forward. I like to play with different silhouette, shapes, texture and I never compromise on the detail and quality of the garments. About Olivier: After receiving fashion education and work experiences in England and Italy for many years, I recently moved to New York City to pursue my dreams of being a fashion designer. Shortly after I moved to New York I was casted as one of the designers on "Project Runway" and my crazy journey began. Being part of the top 8 designers I showed my debut womenswear collection at Lincoln Center - New York fashion week this september. I saw the potential of what I can achieve and now after being on the show I want to continue building this dream. - Rent a bigger studio space which will allow me to work more comfortably, efficiently and concentrated. - Further develop my design concepts through researching into colours, images, textile and experimenting with fabrics. - Make samples and prototypes which includes lots of sewing, fabric manipulation, etc before the collection is finalized. - Have a team of professionals, including photographers, stylist to help me build the final image of the collection. - Rent or collaborate with venues to showcase my work to the public. A final collection of 12-18 pieces(mens and womens) will be shot and shown during New York fashion week in February 2012. This collection will continue my direction of being edgy, androgynous yet having classic and modern elements. I will put more updates on the progress here as they come along. The fashion industry is extremely tough but I have the passion and love to survive! I have a very strong vision that I wish to carry and fulfill!! For many years I worked days and nights without stopping and the final result were always the greatest rewards. With your help I can bring this to the next level!! With $25 (+shipping) you can get this amazing hand printed t shirt! I'm happy to answer any related questions. Feel free to contact me! Every little is so appreciated: I will give you a shout out on my facebook for your contribution! Words are not enough: You will get a signed, hand written thank you card! + Special shout out on my facebook! Stay warm and cool in the cold! 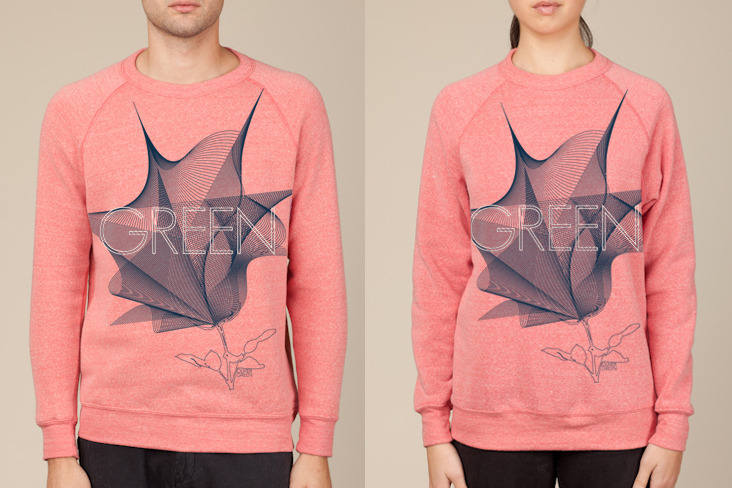 You will get an Olivier Green long sleeve sweater (hand printed in New York) I love sweaters! + special shout out - send in a picture of you wearing the t-shirt and I'll post it on my facebook page! + A signed, hand written thank you card! You will get a signed illustration print from this collection. + An Olivier Green t-shirt (hand printed in New York) + special shout out- send in a picture of you wearing the t-shirt and I'll post it on facebook! + A signed, hand written thank you card! + A signed thank you card. Wow a piece of my babies: A piece from my collections (exclude dresses and outwear: jackets, coats). + A piece from Olivier Green collections and have it custom fitted for you. + Permanent credit as a sponsor on Olivier Green's website. + A hand printed Olivier Green t-shirt (special shout out of you wearing the shirt on my facebook) and a thank you card.